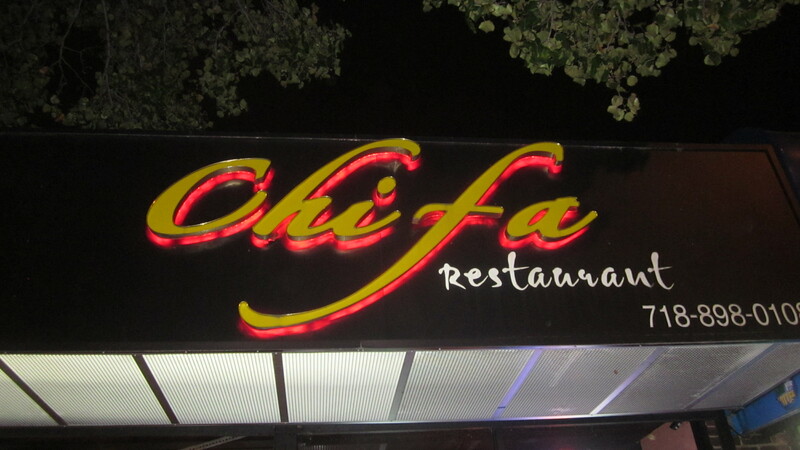 As we were presented with our check for our meal at Chifa, there was some grumbling from the Westchester contingent that it wasn’t right that Zio and I ordered soup as appetizers. “I didn’t think we could have soup,” Gerry stated. “Yeah, it’s against the rules,” Eugene bellowed. “Show me where it says we can’t have soup in our rules,” I responded defensively. “That’s just wrong,” Eugene said, shaking his head. “But you can’t really share soup, so we don’t order it,” Gerry explained. “What are we gonna do share spoons? It just doesn’t work that’s why we don’t do it,” Eugene argued. “How can you eliminate soup from the choices? I love soup,” Zio said. Mike from Yonkers, technically also from Westchester, wisely abstained from the debate, content to slowly pick at the hominy kernels that surrounded what was left of his ceviche mixto. Zio shrugged. “That duck soup was really good,” he said. And I wasn’t just saying that to further infuriate Gerry and Eugene who were still steamed that Zio and I had the temerity to order soup. It was the truth. Granted, Zio and I ordered the soup before Eugene and Gerry arrived and without their consultation—we were waiting in the restaurant, along with Mike from Yonkers, for what seemed like a long time, later finding out there was some confusion on the timing of when we were to meet. Zio’s pick, Chifa, was located on a small stretch of Northern Boulevard that wasn’t a car wash, lube job joint, gas station, or fast food place. Down the block was the Taste of Lahore, which was right next to a dark, inconspicuous Italian restaurant called Trieste. Doing his due diligence as always, maybe Zio was drawn to Chifa, learning that its name translated to mean Peruvian Chinese food and that it was something our group had not yet experienced. Either that or that it was not far from his Astoria love nest. Whatever the rationale for making the pick, Zio wasn’t divulging it. Mike from Yonkers arrived a few minutes later and after sipping cold Cusquena beers while perusing the Chinese-dominant menu, we went ahead and ordered the soups and a couple of appetizers; “wantan frito” also known as fried wontons and “lomo asado,” Chinese bbq pork slices. Gerry and Eugene walked in just as the soups arrived. The sopa pac pow was a steaming bowl of what seemed like a glorified egg drop soup; the big bowl thick with pieces of chicken, duck, asparagus pieces, and shrimp. 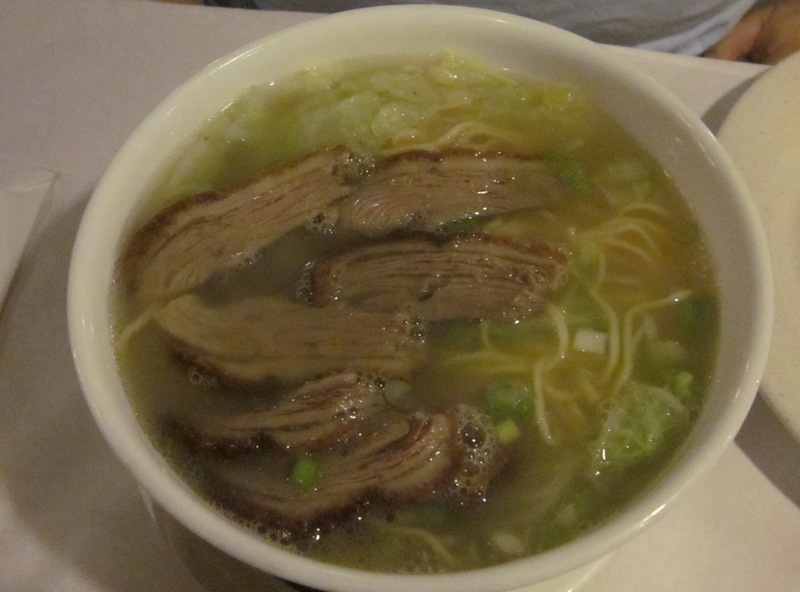 Eugene eyed Zio’s soup, redolent with tender slices of duck, noodles, and vegetables. “What’s that?” Eugene asked him. “Duck soup,” Zio replied, his face down, steam coating his eyeglasses, as he carefully sipped the scalding soup. “That was on TV the other day,” Gerry deadpanned. 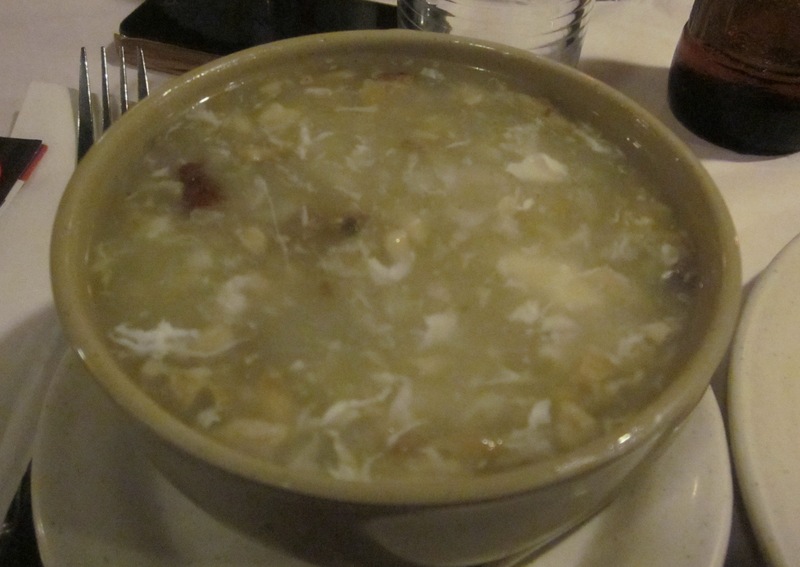 “Hail, Freedonia,” I mumbled, not looking up from my own soup that also had a few slices of that tender duck. After that there was no further discussion of the soups until the complaints at the end of our meal that I’ve already chronicled. Instead the others ordered beers and their own dishes including lomo saltado for Eugene, tai pa, for Gerry, the aforementioned ceviche mixto for Mike from Yonkers, while I went with a noodle dish, tallarin taipa, and Zio choose the pork with garlic. Besides the gargantuan size of the platters—everything was big at Chifa—there wasn’t much to distinguish the Peruvian Chinese from the standard Chinese-American Cantonese that we are so familiar with. 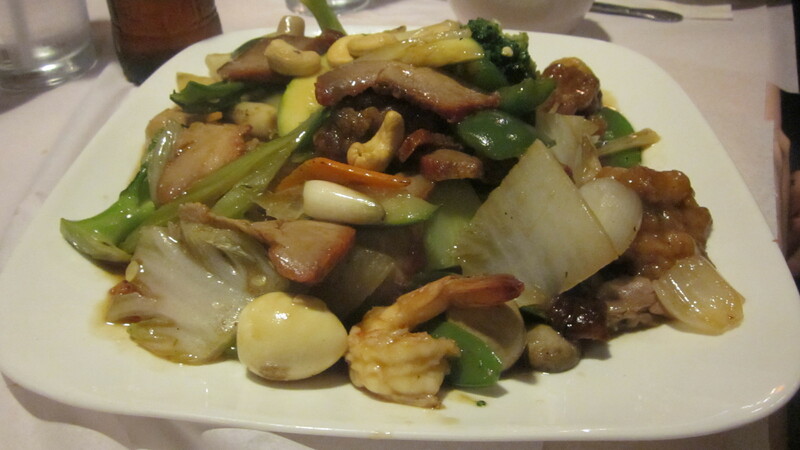 The tallarin taipa, a “mei fun” type noodle dish with an assortment of meats: pork, chicken, baby shrimp, and the duck, was swimming in an oyster/soy sauce while Zio’s pork with garlic was just more of the roasted barbecued pork we had earlier now presented in a barely perceptible garlic sauce with the addition of a few vegetables. The tai pa Gerry ordered, according to the menu, “Chifa’s most popular dish,” was more of the same; chicken, pork, shrimp, duck but with welcome addition of a quail egg and fish ball all combined on a large platter and coated with an oyster/soy based “special sauce.” Even Eugene’s traditional lomo saltado, a mountain of beef, French fries, and onions over rice was not up to my high Peruvian standards for the dish. Maybe it was the addition of the controversial soup or maybe it was just that the dishes were so big, but both Zio and I went home with leftovers. Noting the size of the tai pa that Gerry was putting the finishing touches on, I hadn’t. But also knowing Gerry and his prodigious appetite, I should have. Mike from Yonkers notified our group via email that he wanted to choose a place from his “old stomping ground.” Who knew that Mike from Yonkers’ old stomping ground was the area around 116th Street and Eighth Avenue known as Little Senegal? What we do know is that Mike from Yonkers has some sort of obsession or kinship with African food. In the past, he has directed us to the late, Treichville Treichville Tasting Menu, African American Marayway in the Bronx The Un American African Place, and Salimata Eating Guinea Fowl in a Guinean Place in Little Senegal, just around the corner from his most recent pick, Africa Kine. And like 116th being his old stomping ground, this obsession has never been explained. I never claimed the same area as my old stomping ground, but having lived just a couple of blocks from it, I could have been justified for doing so. 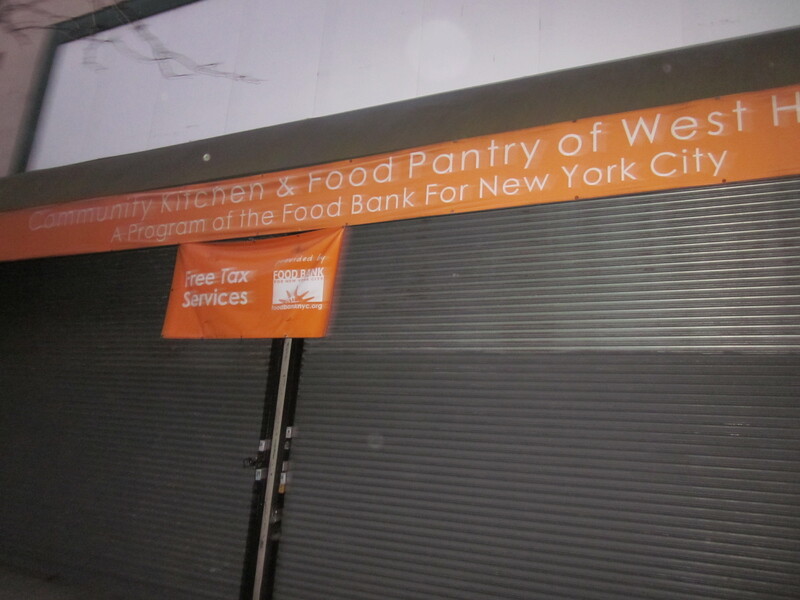 I even spent a few months volunteering at the community food bank next door to Africa Kine, just after the economic meltdown of 2008. The soup kitchen next door. I worked at the soup kitchen washing pots and pans, bagging garbage, prepping food, and even shoveling ice and snow so the food trucks could gain entry to the kitchen. I stopped soon after the chef of the kitchen, who caught on that I was a writer, had me read the beginnings of his autobiographical novel and when, local Mormon missionaries began to flood in to help out making the kitchen more populated than one you would find at a four-star restaurant. But those are stories for another time and place. 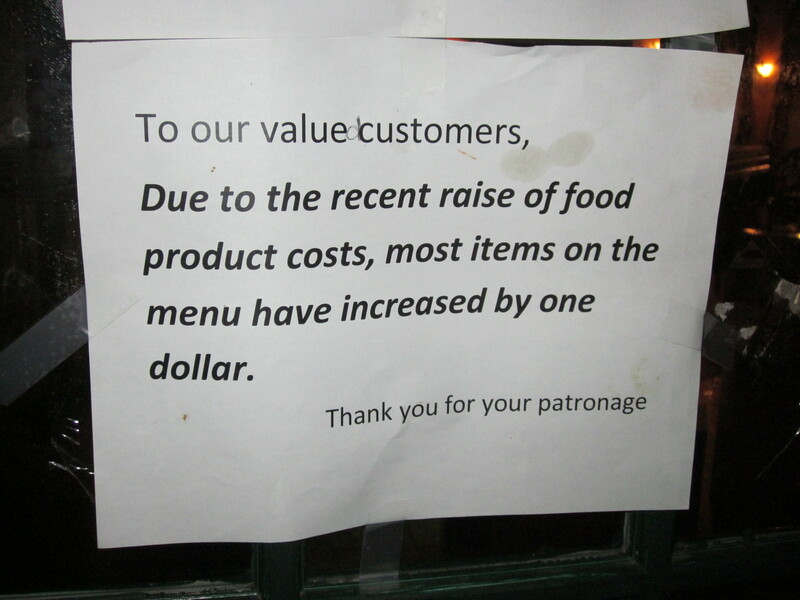 Since my work at the food bank, a raucous, busy beer garden, called the Harlem Tavern has opened across the street, along with a meat market that specializes in local, organic beef and where the butchers wear pork pie hats while they work, and a cookie place where the cheapest, albeit, very good and very large cookie, is four dollars. Those new establishments, among others made parking tough for the group, but Zio and I had no troubles getting to Africa Kine, which was enshrouded in dark netting along with scaffolding in front making it hard to distinguish. On the way in, we passed a legless beggar in a wheelchair and as we entered and started upstairs to the dining area, we both noticed a woman, face down, arms out on a prayer mat. 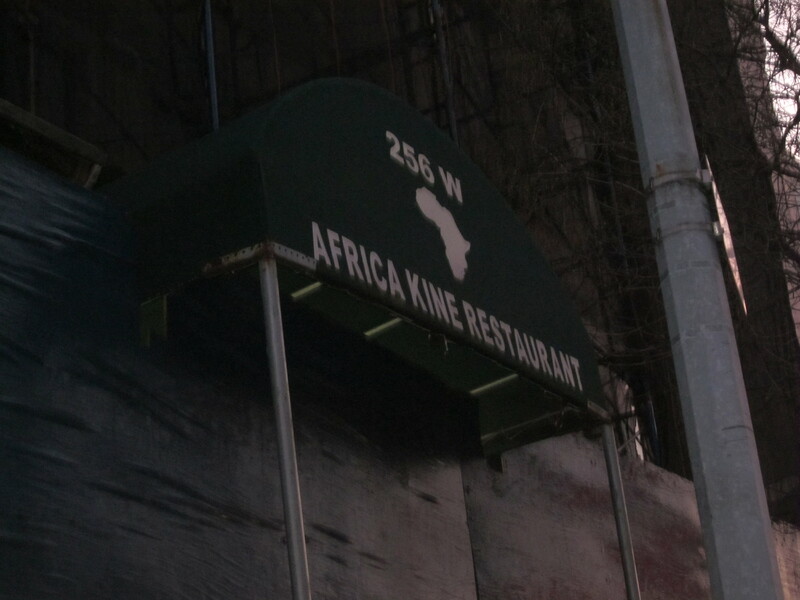 Africa Kine is possibly the most notable Senegalese restaurant in Little Senegal. The dining area is spacious and modern, with high ceilings, comfortable booths, big tables and a number of flat screen televisions, and described in the restaurant’s elaborate website Africa Kine as “luxurious.” Either way, it was most definitely a far cry from what we experienced at either Salimata, Treichville or African American Marayway. The others joined us soon after at a big table in the back of the “luxurious” dining room. While we sipped spicy homemade ginger beer, we perused what, by now was a familiar menu thanks to the African culinary education bestowed upon us courtesy of Mike from Yonkers. There was guinea fowl, chicken, lamb, goat, fish, grilled or fried, and steak. The entrees all came with a choice of one of an assortment of starches; couscous, rice, plantains, yam and a small chopped iceberg salad. Each dish came with onions, sliced, lightly grilled with a mustard-based sauce on them, and scattered over the meat and fish. Most of the entrees also included half a hard boiled egg. Grilled fish with onions and half a hard boiled egg. I’m no expert on guinea fowl, but if I recall, the guinea fowl at Salimata was better, or maybe more distinguishable, than what we experienced at Africa Kine. 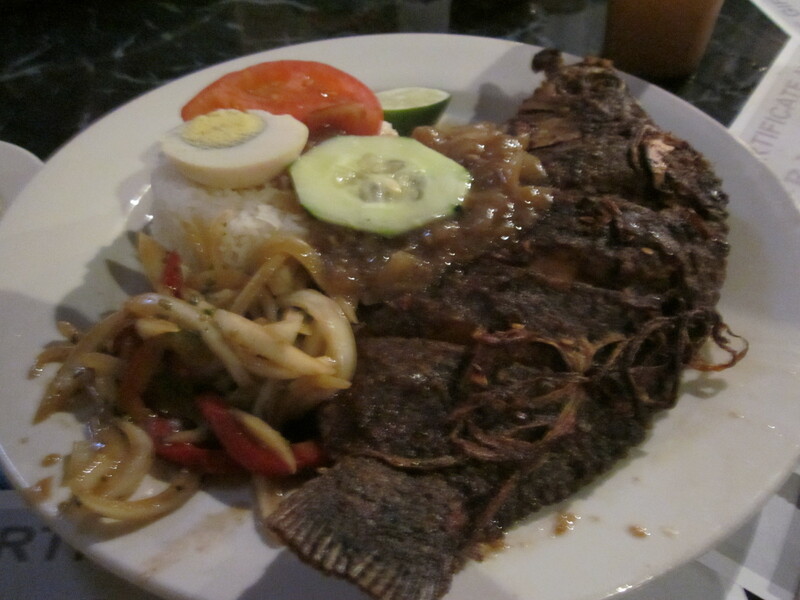 The fish and lamb were also all solid, but there were no raves from our now very picky Senegalese aficionados. So, though the surroundings were comfortable, and yes, bordering on luxurious, the food was not as memorable as many of the more humble African places we have visited. Grilled guinea fowl with onions and a half hard boiled egg (and plantains). 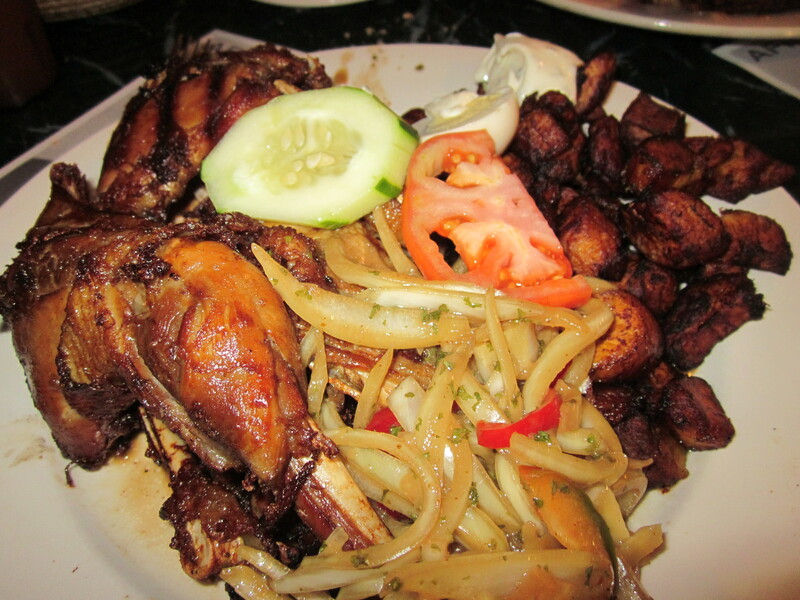 What there was at Africa Kine, however, was plenty of food; the portions more than generous. “Yeah, we just ate a village,” Gerry quipped. And of that village, there were no leftovers.